My friends have politely refrained from pointing out that despite being a self-proclaimed robot maker, it has actually been quite awhile since I built a new robot. But after a very long gestation, the Atomic Falcon has finally reared his newborn head. 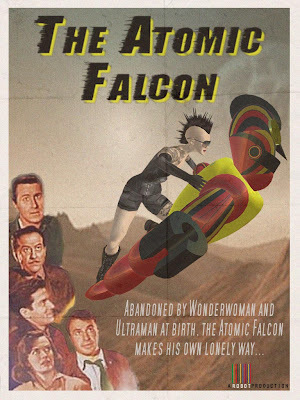 The result of an unlikely and extremely short-lived union between Wonderwoman and Ultraman (they blamed it on cultural issues), the Atomic Falcon was renounced at birth in favour of his respective parents' careers. It's a typical story of neglect, made worse by Atomic's conflicting identity crises. Part-human, part-alien and part machine, Atomic is the anti-thesis of hybrid vigour. Whereas his contemporaries are saving humans from nuclear wars, evil midgets and pesticides - it's all Atomic can do to motivate himself to fly around the atmosphere, keeping a jealous eye on his peers' achievements. Oh, but how well he flies. Will he ever achieve his full potential?